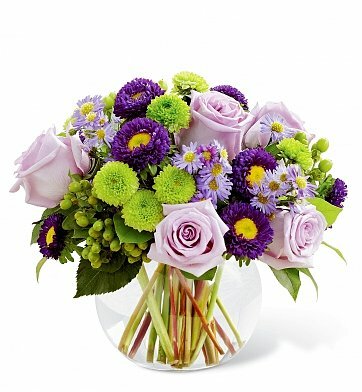 Lively splashes of lavender and purple with green hypericum and button pom bursts of color make this a truly one-of-a-kind arrangement. Perfect for all occasions, the bouquet arrangement is handcrafted by an expert florist and delivered directly to your desired location with fresh water in a keepsake glass vase. Measures approximately 9" x 10". Upgrade to the "Better" or "Best" version for more flowers and a larger bouquet. Splendid Day Bouquet is a hand delivered gift. These gifts are delivered by one of our local design centers located throughout the United States and Canada. Same day delivery is available for most gifts when ordered before the cutoff time. The cutoff time for Splendid Day Bouquet is 2 PM in the recipient's time zone.